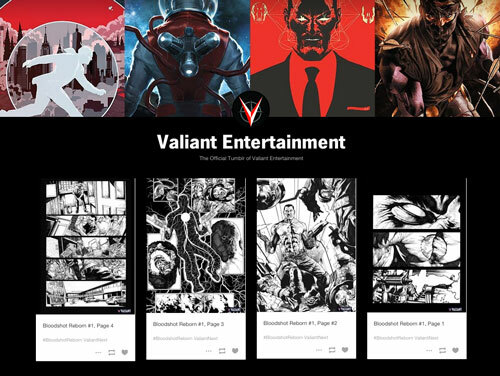 Valiant is proud to announce the launch of the all-new Valiant Entertainment Tumblr (valiantentertainment.tumblr.com), beginning today with a day-long showcase of the complete artwork from BLOODSHOT REBORN #1 by New York Times best-selling writer Jeff Lemire (THE VALIANT, Green Arrow) and superstar-in-the-making Mico Suayan (HARBINGER, Moon Knight)! From 12 noon ET onward, the official Valiant Entertainment Tumblr will serialize all 25 pages of inked interior artwork from April’s BLOODSHOT REBORN #1 – the highly anticipated first issue of the latest series from the VALIANT NEXT initiative. Months in the making, Mico Suayan’s exquisite interior artwork features a level of detail rarely seen in the comics medium. Renowned for his covers for HARBINGER, ARCHER & ARMSTRONG, ARMOR HUNTERS, and more, Suayan now brings his star talent to the interior page for his first ongoing series at Valiant. In the days ahead, the official Valiant Entertainment Tumblr will feature daily updates and behind-the-scenes looks inside Valiant’s award-winning line of titles, including X-O MANOWAR, IMPERIUM, DIVINITY, IVAR TIMEWALKER, UNITY, RAI, and more…plus special advance glimpses of projects yet to come. On April 15th, the VALIANT NEXT initiative presents BLOODSHOT REBORN #1 – the first issue of the all-new ongoing series from all-star creators Jeff Lemire and Mico Suayan! Bloodshot’s nanites made him a nearly unstoppable killing machine. His enhanced strength, speed, endurance, and healing made him the perfect weapon, and he served his masters at Project Rising Spirit – a private contractor trafficking in violence – very well. Now, Bloodshot is a shadow of his former self. He lives in self-imposed exile, reeling from the consequences of his past life and the recent events that nearly drove him mad. But when a rash of shootings by gunmen who appear to look just like Bloodshot begin, his guilt will send him on a mission to stop the killers, even if it means diving headlong into the violence that nearly destroyed him. Beginning today, get an exclusive look at rising star Mico Suayan‘s complete artwork for the most anticipated Valiant release of 2015 – BLOODSHOT REBORN #1 – by following the official Valiant Entertainment Tumblr!